For the Game Boy Advance game, see Pokémon Pinball: Ruby & Sapphire. For the Pokémon mini version, see Pokémon Pinball mini. 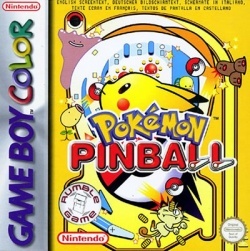 Pokémon Pinball(ポケモンピンボール, Pokémon Pinbōru in Japan) is a pinball game based on the games Pokémon Red and Blue. In it, the ball is a Poké Ball, and most of the objects on the table are Pokémon-related. Like a pinball game, the main objective is to get points, using the different modes of advances to score them at a higher rate. Pokémon Pinball has a secondary objective hinted at by the tagline "Gotta Catch 'em All," which is to collect all 151 Pokémon to fill your Pokédex. The Pokédex is saved between individual games, so it can be built up over time. This page was last edited on 7 September 2015, at 21:42.